Time to call the vet? This page offers general advice about feline pregnancy and how you can care for your cat. Talk to your vet about the best way to care for your pregnant cat. Heat cycles usually stop during pregnancy, but sometimes they continue. If mating occurs again during pregnancy, this can lead to further foetuses being conceived and kittens born with different fathers in the same litter. Pregnancy can be diagnosed by the vet using abdominal palpation from around three to four weeks of age, or by using ultrasound. Pinking up - enlargement and reddening of the teats - may be seen from around three to four weeks of pregnancy. The queen will need to eat more than usual, especially in the last three to four weeks of pregnancy when she needs approximately 25 per cent more food. Feed her kitten food in regular meals. Continue this feeding regime while your cat is suckling as she will use double her usual energy requirement. Water is also vital for your cat's health, so make sure that pregnant, birthing and lactating queens have constant access to water, but during and after birth this must be out of reach of kittens to prevent them drowning. Queens may search for a suitable place to give birth. Ideally, pregnant queens should be introduced to a quiet, clean and warm kittening area away from the family and other pets at least two weeks before the expected birth date. Provide warm blankets and clean sheets that can be washed and replaced as necessary. We recommend talking to your vet before your cat breeds, to make sure that your cat is fit to breed and properly vaccinated. If your cat is already pregnant, ask your vet for advice on caring for your cat, including feeding, worming and flea treatments. You must use treatments that are safe to use during pregnancy. Your cat can be neutered while pregnant, but you should discuss this with your vet. 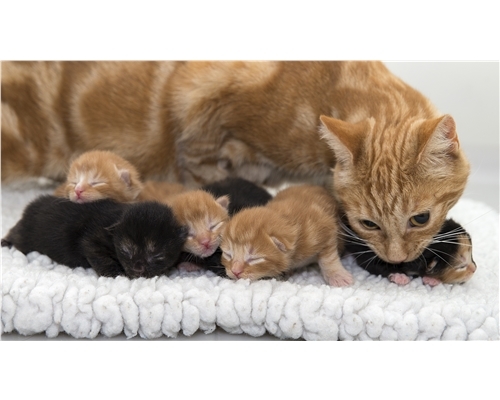 Neutering during pregnancy may be recommended following an unwanted mating or if there are significant health risks to the queen and/or the kittens.